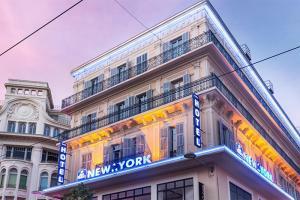 Ideally located in the city center of Nice, this hotel is near Place Massena and the Basilica of Notre Dame. In this lively neighborhood, you'll find Nice's main shopping street, with over 100 stores and the Nice Etoile shopping center. 50 soundproofed rooms offer a cozy ambiance with luxury bedding, free Wi-Fi and cable TV and other conveniences. Enjoy a delicious buffet breakfast or a drink at the bar and lounge. This hotel is about a 13-minute drive from Nice Airport, and a 7-minute walk from Nice City Station.